Dencarik Beachfront Villa: The Dencarik Beachfront Villa offers you paradise. It has 4 bedrooms and 2 bathrooms. It has a spacious living room with harmonica doors, a swimming pool, terrace, garden, gazebo and offers internet services. The Dencarik Beachfront Villa has 1400 sqm plot and 240 m² living area. Its current selling price is 325,000 Euros. Lokopaksa Beachfront Villa: This villa is surrounded by a garden which has ponds, palm trees and exotic plants. It has a private swimming pool and a Jacuzzi. The villa has a lounge area where you can enjoy the sunset. It has three (3) bedrooms, three (3) bathrooms, it is furnished, has a land size plot of 3,000 m² and living area of 280 m². The current selling price of the vacant property for sale or vacant land for sale at Lokopaksa is 495,000 Euros. Lovina villa: This is a vacant property for sale in Tukad Mungga. The villa was constructed in 2016 and it is furnished, has a terrace, garden, gazebo and balcony. The villa offers a view of the ocean; it has a 300 m² land size plot and a leasehold ownership title. The current selling price is 239,000 Euros. 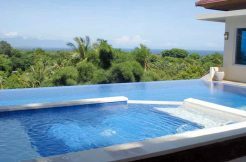 Lovina Hillside Villa: This vacant property for sale offers a view of the ocean and mountains. It has five (5) bedrooms, five (5) bathrooms, a guest toilet, a swimming pool with a pool deck, a spa/massage room, a tennis court and a gym. From the dining room of the villa you can reach all rooms. The Lovina Hillside Villa was constructed in 2012. It has a land size plot of 3,000 m² and living area of 625 m². Its current selling price is 399,000 Euros. Tropical Beachfront Villa: This villa is in Brongbong. It has a land size plot of 4,000 m² and living area of 365 m². 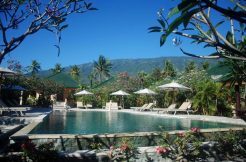 The villa has three (3) bedrooms, three (3) bathrooms, has internet services, a terrace, gazebo, garden and staff quarters. The villa was constructed in 2010 and its current selling price is 459,000 Euros. Umeanyar Villa: This villa is surrounded by rice fields and it offers a view of the ocean and mountains. The villa was constructed in 2017 and it has three (3) bedrooms 2 of which have en-suite bathrooms. It is equipped and semi furnished. It has a gazebo, covered terrace and garden. The current selling price is 499,000 Euros. Lovina House: This house is in Kalibukbuk. It has a land size plot of 1775 m² and a living area of 140 m². The Lovina house was constructed in 2008 and it has three (3) bedrooms, two (2) bathrooms, a gazebo, covered terrace, is equipped and furnished. The current selling price is 197,000 Euros. North Bali Beachclub: This is at Bondalem. It has a land size plot of 4360 m², has nine (9) bedrooms, nine (9) bathrooms, a gazebo, pool deck, swimming pool, restaurant, is equipped and furnished.